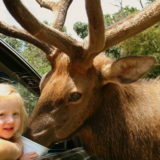 180 Acre Drive-Thru Adventure featuring over 1,000 free roaming animals from around the world. Come feed, pet, and enjoy! The 2018 season beings March 10 and the park is open daily at 9 a.m. through November 25. Closed Thanksgiving Day. Active military receives a FREE bucket of animal feed! Check website for admission rates.